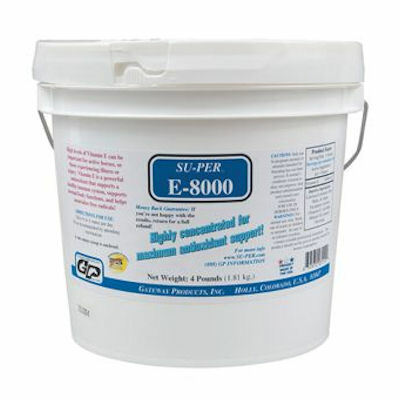 Vitamin E 8000 Powder - 4lbs. Vitamin E 8,000(Gateway)(4 lbs)is an extra strength 8,000 IU per ounce Vitamin E powder for convenient use in the treatment of EPM. Vitamin E is an essential vitamin, an important antioxidant, and a free radical scavenger. May also have a beneficial anti-inflammatory effect and promote healing of damaged nervous tissue. Each 1 ounce daily serving supplies 8,000 IU of vitamin E.